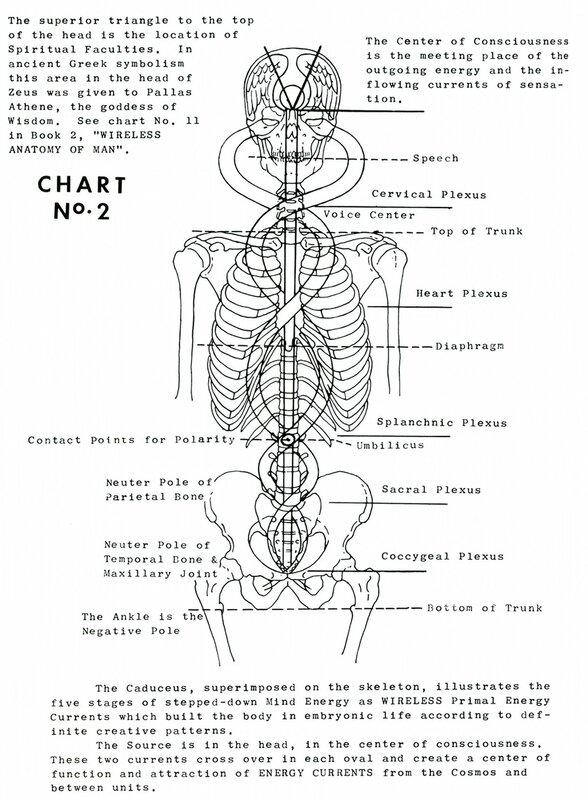 The superior triangle to the top of the head is the location of spiritual faculties. In ancient Greek symbolism this area in the head of Zeus was given to Pallas Athene [Athena], the goddess of wisdom. See chart No. 11 in Book 2, "Wireless Anatomy of Man". (A) The Center of Consciousness is the meeting place of the outgoing energy and the inflowing currents of sensation. 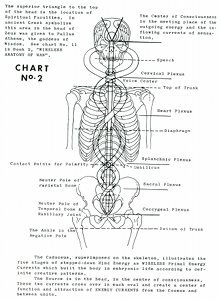 The caduceus, superimposed on the skeleton, illustrates the five stages of stepped-down mind energy as wireless primal energy currents which built the body in embryonic life according to definite creative patterns. The source is in the head, in the center of consciousness. These two currents cross over in each oval and create a center of function and attraction of energy currents from Cosmos and between units. Book 1, "Explanation of Chart No. 2"